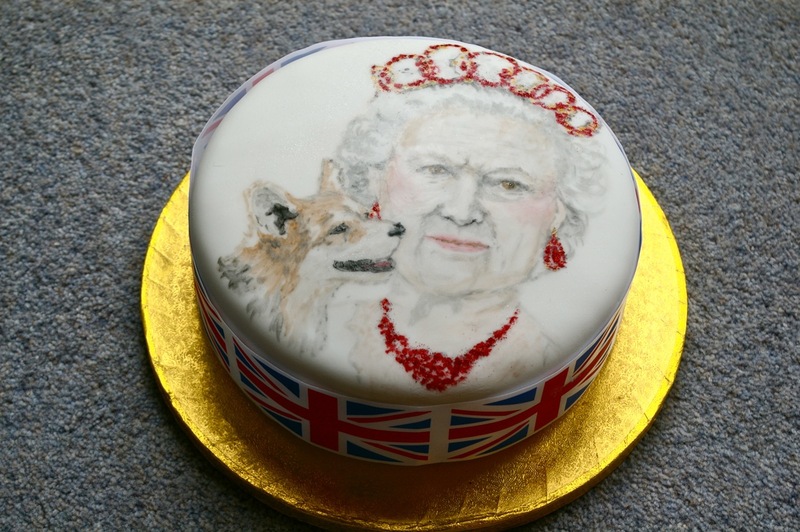 It's a basic vanilla sponge with cherry jam and buttercream in the middle, covered in fondant icing and painted with food colourings...and edible glitter. I really LOVE edible glitter; surely everything is improved with a bit of sparkle! I want to try some other clothes combinations. 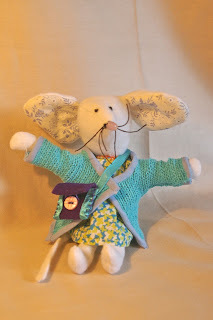 If I can make sure the mice are all the same size, I could make changes of clothes for them, which would be fun to do...and once the mice are on course, i think I may try making a rabbit too. Max was very interested in the little mouse, but luckily Ellen Mouse escaped unscathed! My other project this week has been butterflies. I had it in mind it would dead easy to quilt a little butterfly to display in a small box frame, but it has been really fiddly to make something so small remain delicate. I think I have worked it out, and have been staining frames today, but you'll have to wait until next week for the finished piece! Who knows I may even have another quilt square too. Such a cute little bag! It's just wonderful! 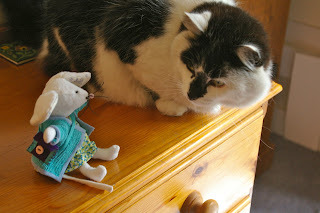 I see a whole array of product together with Ellen Mouse: cradle (for Ellen's babies), bed, bike, a small house cat (wouldn´t it be funny if Ellen Mouse had a small pet: a cat?!) and so on! I have been contemplating a wardrobe for Ellen Mouse...pyjamas and wet weather gear. 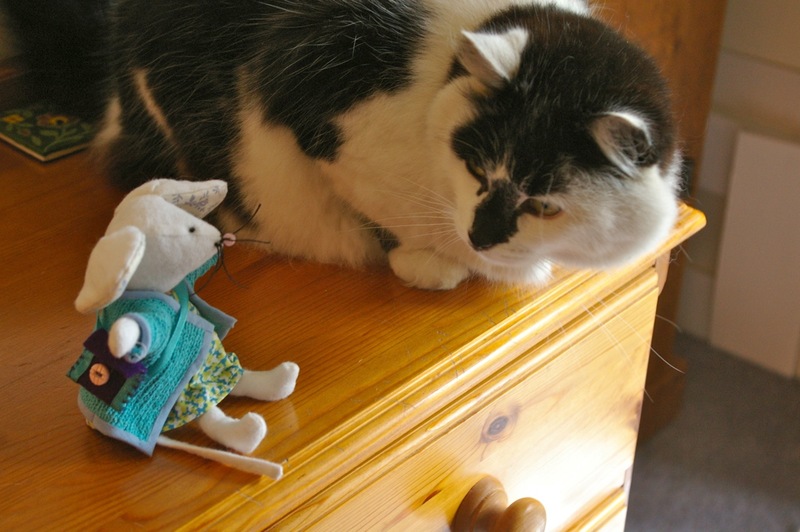 I love the idea of a pet cat and find myself wondering how difficult needle-felting might be in order to make one! 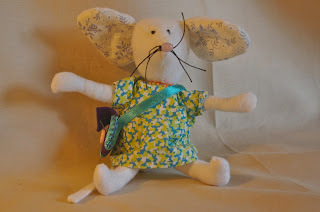 I believe that Ellen Mouse is a very brave little lady, who is not afraid at all of cats. Just look how calmly she returns Max' stare! 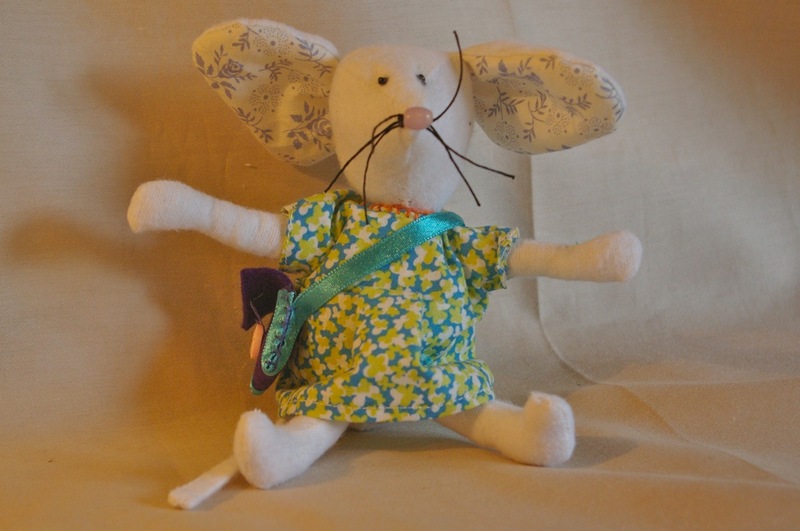 Ellen is indeed a fearless mouse - she stands up to Max far better than the butterflies do. I do have catnip cat toys on my to make list, and I had better get on with it as yesterday Max proudly brought in a poor little gråsparv (house sparrow?) he had killed.